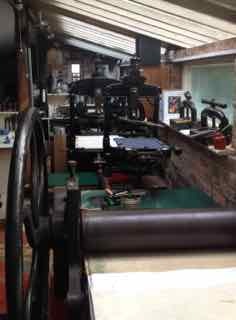 Artist’s print workshop founded in 1974 to publish limited edition fine art books, etchings, wood engravings and block prints. Arab platen press 10” x 14” inches. Columbian platen press, Dixon & Co 18” x 24” inches. An ‘open access’ print-workshop with 2 day courses in etching/wood engraving/block printing.